When planting watermelon, choose a variety that appeals to you. Watermelons can be as small as 3 pounds or as large as 200 pounds, depending on the variety. Some varieties are seedless. Others have orange flesh, as opposed to red. After you've chosen the variety you want to plant, make sure the soil has been well tilled. The dirt should be loose and airy down to a depth of 8-10 inches. If you have fairly dense soil, work some organic material into the dirt. This might include well rotted manure, grass clippings or compost. Additionally, make sure you have enough space in your garden. Watermelons need plenty of room so you should allow 6-8 feet between plants. You should select a location that gets at least 6-8 hours of direct sunlight everyday. 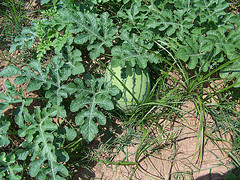 When planting watermelon, the seeds are usually directly sowed in the garden. 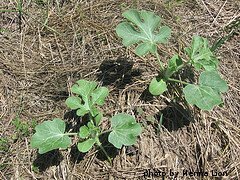 Watermelon plants don't tolerate root disturbance very well, so transplanting seedlings usually leads to a high failure rate. If you have a very short growing season and need to start the seeds indoors, use biodegradable pots that can be planted in the ground. Wait until to soil temperatures have warmed to 70 degrees F before planting watermelon. Using a hoe or garden rake, create mounds or hills that are 4 feet across and about 6 inches high. Using the end of a hoe or your finger, make holes in the mounds 1 inch deep and 6-8 inches apart. Place a seed in each hole and cover with loose soil. You will be able to fit 7-8 seeds in each mound. After planting, water the seeds in thoroughly. After the seedlings emerge and are a couple of inches long, you should keep the 3 most promising plants and pull the rest out of the ground. This process is known as "thinning". 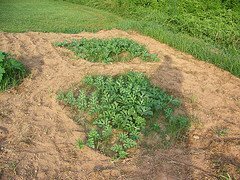 Because watermelons have such a high water content, too many plants in one mound will lead to poor fruit production. More plants competing for the same amount of water and nutrients will lead to poorly formed watermelons. Now that you're done planting your watermelon patch, you can think about watering and fertilizing your plants for maximum fruit production.